Paul Rudd is a miniature miracle in a fun family adventure about a superhero who can shrink to the size of an ant thanks to a special suit. After their recent risk with lesser-known comic book property Guardians of the Galaxy, Marvel do it again with Ant-Man – the 12th film in their cinematic universe – and the result is a charming and eccentric heist film with a great sense of humour. Though original director Edgar Wright and collaborator Joe Cornish left the project over creative differences – with Peyton Reed taking over at the helm – their stamp is still on the blueprints and the pair are credited as screenwriters (along with Adam McKay and star Rudd). We meet cat burglar and electrical engineer Scott Lang (Rudd) just as he’s leaving San Quentin Prison. He’s determined to go straight, but he finds it’s not so easy to escape his past as a Robin Hood of sorts, who turned the tables on a greedy corporation. Scott's ex-wife Maggie (Judy Greer, once again underused in a mother / wife role) has moved on and married cop Paxton (Bobby Cannavale), and his young daughter Cassie (Abby Ryder Fortson) misses him dearly. Desperate to be reunited with Cassie, Scott turns back to crime, and in doing so meets retired scientist Dr Hank Pym (Michael Douglas) and his daughter Hope (Evangeline Lilly), who set him the small task of saving the world from the threat posed by Pym's former protégé Darren Cross (Corey Stoll). The father-daughter relationships add splendid emotional weight, while the film also addresses the female-fronted superhero film dilemma through the character of Hope. 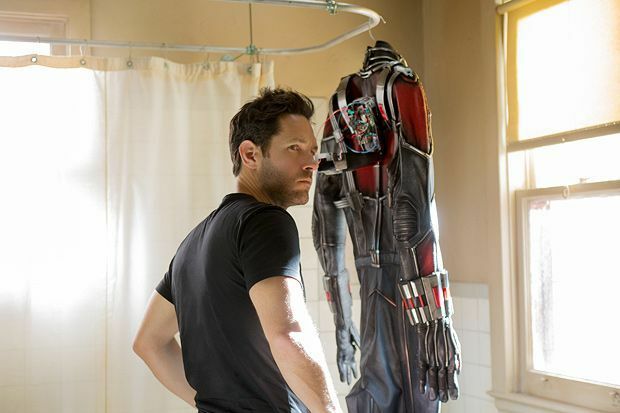 Ant-Man's shrinking sequences are brought to glorious life with state-of-the-art technology – including 3D – and the action scenes are both intricately detailed and, at times, downright hilarious. Reed's fifth feature bucks the mass destruction trend seen in other Marvel efforts, with the decision to adopt a lighter tone also working in its favour. There’s still mayhem but it’s gilded with a sense of responsibility and mischief. For example, during a major heist one of Ant-Man’s crew – a scene-stealing Michael Peña – returns to release one of the security guards he previously knocked out. These quieter moments are dotted amongst subatomic explosions, nifty hand-to-hand combat sessions and ant armies helping in the quest for a better tomorrow, and it all adds up to an utter delight.